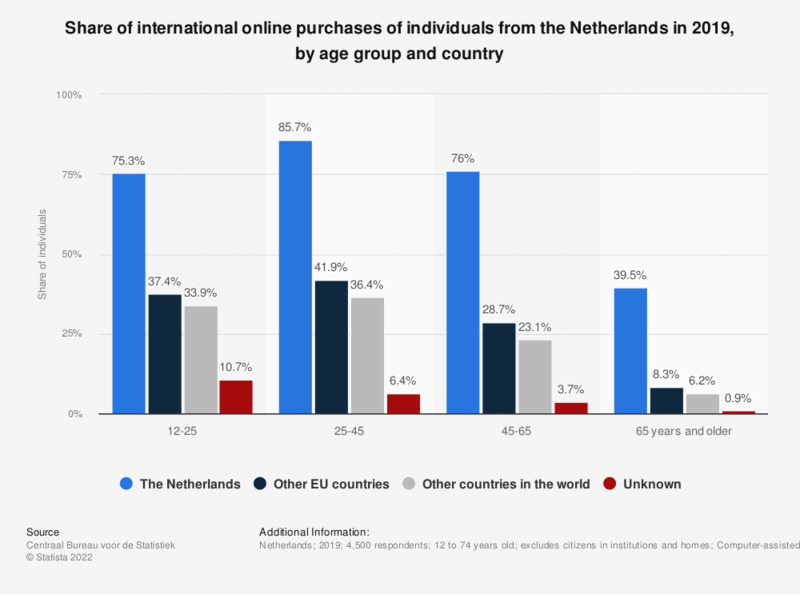 This statistic illustrates the share of international online purchases of individuals from the Netherlands in 2018, by age group. As of 2018, roughly 29 percent of Dutch respondents aged 45 to 65 years old made an online purchase from an other EU country. * This question was phrased by the source as follows: "In the past 12 months, have you purchased or ordered goods or services for private use from people or companies from: the Netherlands? Other EU countries? Other countries in the world? An unknown country?" The original question was phrased in Dutch as folows: "Heeft u in de afgelopen 12 maanden goederen of diensten voor privé gebruik via internet gekocht of besteld van personen of bedrijven uit: - Nederland? - andere EU-landen? - andere landen van de wereld? - onbekend land?"